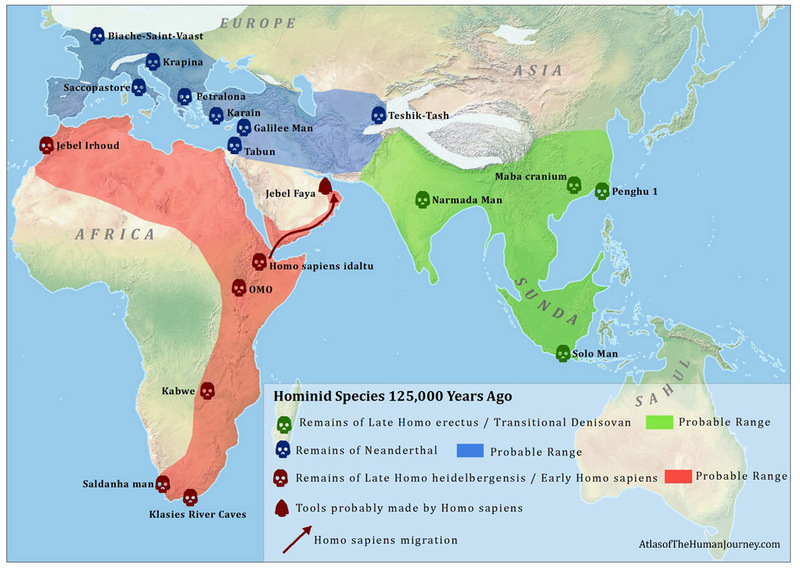 By 125,000 years ago, large brained hominid species were living in Europe, Asia and Africa. In Europe and the Middle East lived the Neanderthals, a species very similar to humans but stronger and stockier. In East Asia lived the last remnants of Homo erectus that had evolved a brain size almost as large as Neanderthals and modern humans, and in Africa lived our own ancestors: the first modern humans (Homo sapiens). The first evidence of our own species leaving Africa comes from the advanced stone tools found at Jebel Faya in the United Arab Emirates, dated to between 125-90 thousand years ago. The tools are typical of those made by Homo sapiens of the same time in Africa. (See map 1 – 125,000 years ago). Stronger evidence comes from the actual skeletal remains of Homo sapiens remains found in Israel at both Qafzeh and Skhul that date to between 115-90 thousand years ago. (See map 2 – 90,000 years ago) Neanderthals were also present in the Middle East at this time, and there is evidence that Homo sapiens both fought and interbred with them. The evidence of conflict comes from the remains of Neanderthals found at Shanidar Cave in Iraq. One of the Neanderthal skeletons has a wound made by a projectile weapon which Homo sapiens were known to use at this time. (Churchill) The evidence of interbreeding comes from DNA studies: all modern humans outside of Africa have small amounts of Neanderthal DNA (1-4%), (Lohse)which suggests that Homo sapiens most likely interbred with Neanderthals in the Middle East in this early period before migrating to Europe and the rest of Asia. At about the same time as the first Homo sapiens were settling in Australia, or perhaps a little later, Homo sapiens also entered into Europe. For about 10,000 years Homo sapiens and Neanderthals shared Europe, and there is also evidence that they interbred with each other. (Tattersall)At Mladlec, Cioclovina, and Lagar Velho, remains have been found of Homo sapiens with some Neanderthal characteristics. (Duarte)(See map 5 – 30,000 years ago, and map 6 – 20,000 years ago) But by about 29,000 years ago, pure Neanderthal remains disappear. The cause of the demise of the Neanderthals is unclear. But since they had lived in Europe for hundreds of thousands of years and went extinct within about 10,000 years of the arrival of Homo sapiens, it seems plausible that their extinction was caused by Homo sapiens. Perhaps our ancestors wiped them out through warfare? Or perhaps we simply outcompeted them in hunting the scarce resources of Ice Age Europe? Or perhaps we interbred with them so much that their genes were gradually drowned out in the genes of more numerous Homo sapiens? (Modern humans outside of Africa have between 1-4% Neanderthal DNA). Most likely the fate of the Neanderthals lies within a combination of all of the above. There seems to have been something unique in the way Homo sapiens thought that contrasted with other hominids: wherever Homo sapiens went they created artwork. The earliest example of artwork comes from Blombos Cave in South Africa, dated to between 100,000-70,000 years ago. But by 40,000 years ago, as Homo sapiens expanded across Europe, Asia, and Australasia, we see an explosion of art in the form of human and animal figurines, decorative body ornaments, and cave paintings. One of the striking features of early human art is that we can see similar artistic styles on other sides of the world from each other. For example similar hand stencils, made by placing the palm of the hand on a cave wall and spraying paint around the hand, can be found at El Castillo Cave in Spain, at Maros Cave in Indonesia, and at Cueva de los Manos in Argentina. In Europe we cannot be 100% sure that all of this artwork was made by Homo sapiens because Neanderthals were occupying the same region. In fact body ornaments found at Grotte du Renne in France were most likely made by Neanderthals.(Ref.) Which means that Neanderthals were perhaps also simultaneously developing an appreciation for art, or were copying the culture of the newly arriving Homo sapiens, or through interbreeding with Homo sapiens, had recently acquired some of the human genes for artistic expression. wild foods into domestic foods. 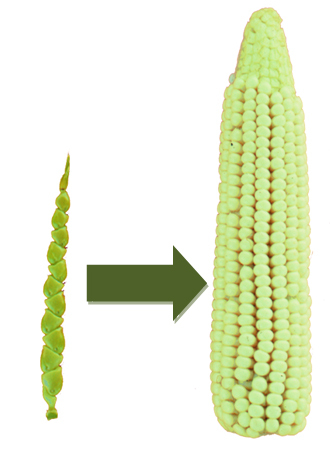 Top: wild corn (Left) compared to domestic corn (Right). 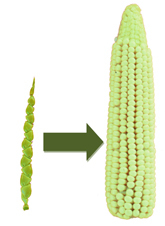 Bottom: wild Banana (Left) compared to domestic banana (Right). Starting around 11,000 years ago, Homo sapiens started to select, breed, and domesticate plants and animals. The development of agriculture occurred many times independently, first in the Fertile Crescent of the Middle East around 11,000 years ago with the cultivation of wild grains into wheat and barley. Then around 9,000 years ago, rice was cultivated in China, and bananas and sugar cane in the New Guinea Highlands. (See map 9 – 10,000 years ago). Over the next few thousand years, agriculture would continue to spring up in new places and spread into new regions. It was developed independently in the Americas with the cultivation of maize, and the cultivation of wheat and barley spread from the Near East into Europe. In the more arid areas of North Africa, Arabia, and Central Asia mobile pastoralists domesticated sheep and horses. (see map 10 – 7,000 years ago). Thus mankind had transformed itself from simply a predator to a producer. Agriculture did not just mean growing crops and raising animals, but also selecting the biggest, strongest and most nutritious specimens and breeding them over many centuries to produce more and more useful plants and animals. In fact the majority of the foods and animals that humans eat today are markedly different from their wild ancestors because they have been bred by humans to maximize their size and nutrition for so long.